This stealthy sleep tracker attaches to your pillow and helps monitor the quality of your sleep. Wake up to a thorough report of your sleep cycle, body movement, and sleep time. Then set it up to put you to bed with soothing tunes and wake you during your lightest mode of sleep. Sleepace even gives you custom advice on how to curb restlessness and boost your sleep habits. Dimensions: 1.3" x 1.3" x 0.52"
Getting this thing set up was a major challenge. Documentation is minimal, and on-screen and on-line help is barely in English and less than helpful. I think I've got it working now, and I am fascinated. Jury's out as to how useful it actually is, but I'm giving it a shot. Stopped working after two weeks. Rest assured. This tiny sleep tracker attaches to your pillow and notes your nocturnal habits to help improve them. You’ll get a full-fledged report of your sleep cycles, body movements, and sleep time synced to your phone. This all gets averaged out into a “sleep score” along with information on how to boost it. 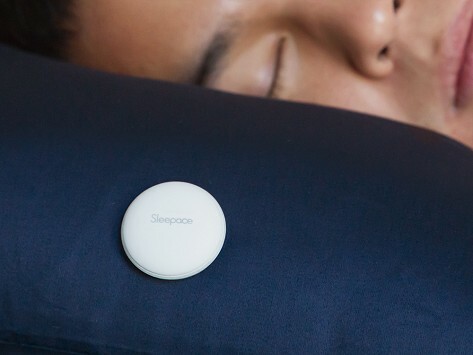 Let Sleepace help you drift off with soothing music. Wake up at the best time for you—set the alarm to go off during your lightest sleep mode. The app will even give you tips to improve restlessness and make sure you get a full night’s rest. It’s like having a personal sleep trainer, working to help achieve a healthier, more well rested you.